Dejiang No. 1 High School was founded in 1940. And “Dejiang County Junior High School” was its name. However, its name had been changed to “Dejiang Junior High School of Guizhou Province” after the founding of new China. We began to run a Senior High School in 1958, renaming it “Dejiang No. 1 High School of Guizhou Province”. Then it developed as an independent high school in 2000. It was in 2004 that our school successfully upgraded itself as a donmonstating senior high school in Tongren District. The school has trained 22,000 high school graduates, 12 thousand of which are sent to higher education. The overall educational level has been improved, especially during the recent ten years, making great contributions to the economic and social development for the society. The teaching quality has been among the forefront of similar schools in Tongren city since the beginning of 2003. More than 100 students go to key universities each year, being one of the best developed schools in Tongren city. There are 80 classes, 4800 students, 317 teachers. Among them are 1 superfine teacher, 82 senior level teachers and 56 junor level ones. Six teachers even have a degree of postgraduate. Six teachers are provincial backbones, 12 being city level and 32 being county level backbone teachers. There are 11 famous teachers in the town. The county government commited to expand our school, moving it to a new campus with an investment of 0.345 billion RMB. The new campus was founded on May 8th, 2012. It now covers an area of 320 Mu, with a total construction area of 75600 square meters. It is a boarding high school with an accommodation for 6000 students and 108 classes. The new campus has buildings for teaching, labs, science, arts, library, cafeteria and student hostels. The stadium and art museum are being finished projecting. At present, our school moves to the new campus. (2) Holding teaching experience - TEFL / TESOL / CELTA. (3) BA Degree: or above (Education and Language degrees given top priority) preferred. (4) Able to apply for Z visa. (3) Z visa provided by the school. (1) 20 teaching hours a week. (1) Please send your application to our email: susan.wang@esljobs.com.cn . (2) Please include a photo of your passport in your application. Known as “Port of Northeast Guizhou”, Dejiang is located in the northeast of Tongren City, Guizhou Province with a population of 0.53 million and with an area of 2072 square kilometers. The county is convenient in transportation with Highway 326 and Highway 303. Wujiang River runs through the town for 65 kilometers. 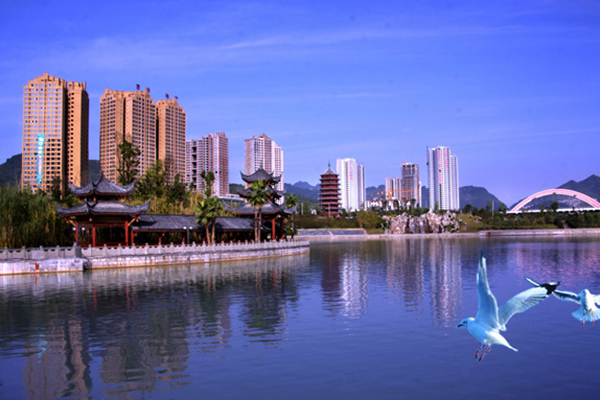 As an old revolutionary base, Dejiang is home to “Nuo Opera”, “China folk culture and arts”, “Tianma” and “Strange stones”. Guizhou Provincial Party Committee, Provincial Government determined to make Dejiang as a transport hub and as a regional center city in Document 9 in 2010. Three Highways, Four Subways and One Port will be joint here. Dejiang is a beautiful city, and also an old revolutionary base, Dejiang is home to “Nuo Opera” … . Dejiang No. 1 High School of Guizhou Province is a representative school of Guizhou province. The campus is beautiful and has national feelings.